John Deere’s new 8000 Series self-propelled forage harvester, featuring the company’s latest fuel-efficient, Stage IV compliant engine, will be making its UK working debut on the John Deere stand at the 2015 Grassland UK event in May. Additional new features on the 8000 Series foragers include the ADS Twin Line fully integrated advanced dosing system for silage additive application, and a wide range of headers. These include grass pick-ups from 3 to 4.5m and Kemper rotary headers from 6 to 9m wide. Kemper maize headers are optionally available with automatic steering and/or automatic header control. For wholecrop harvesting, John Deere also offers the Zürn ProfiCut 620, a highly efficient silage header that leaves clean, low-cut stubble. 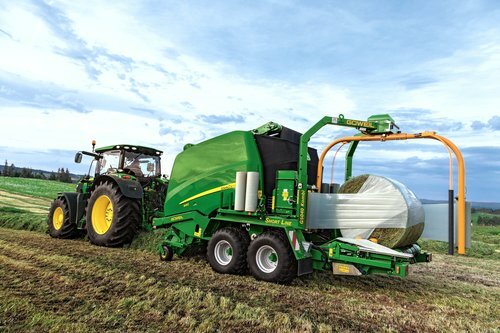 The new John Deere L1533 large square baler can also be seen working for the first time at a UK event. Designed to increase the baler’s performance, the proven high-capacity feeding system features an inline rotor and augers to prevent plugging.